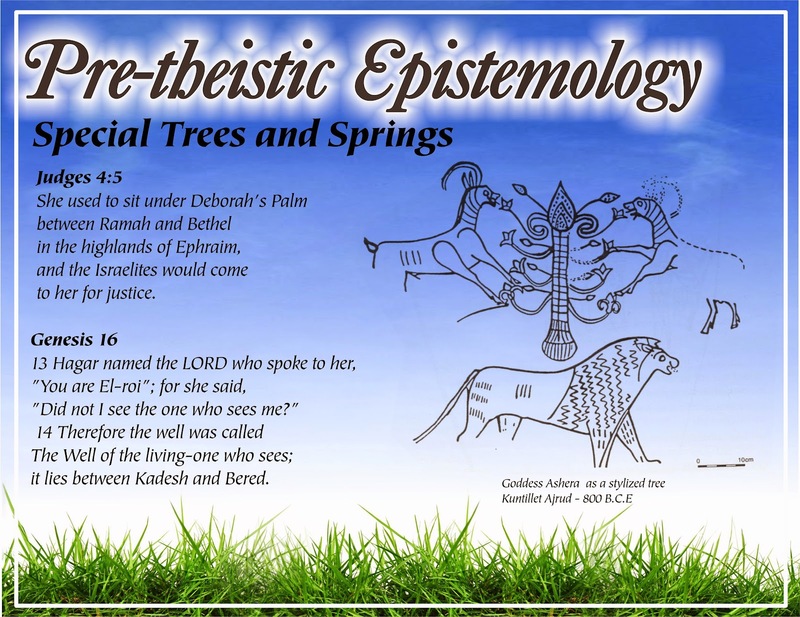 This time we will be talking about archaic epistemology which I would call, for lack of better words, remnants of biblical animism. Animism will not be for us today a fully formed religious system; rather it will be that mode of thinking and relating to the outside world in which boundaries between divine, spiritual, human and natural (animate as well as inanimate) remain largely fluid. We will concentrate especially on how this less regimented mode of thinking can influence our understanding of the biblical text, our faith, our self-understanding and relationship to the world. The Bible preserved only two reports of speaking animals. The biblical editorial process was driven by a developing strict monotheism which certainly led to the elimination of many other examples. These two instances of talking animals were not eliminated, most likely, because in these two stories the talking animals were an integral part of the narrative plot. 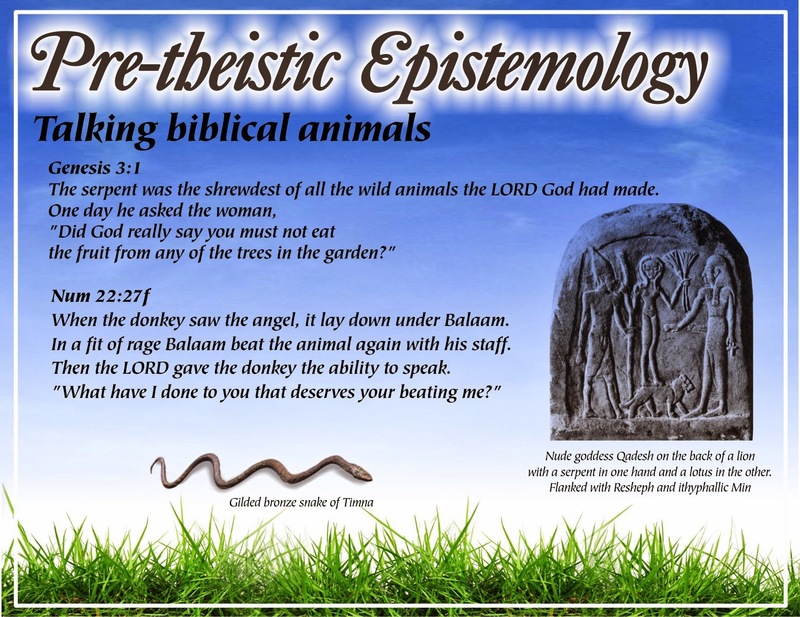 Also both stories used talking animals (remnants of animism) in an important dogmatic (Genesis) or folkloric (Numbers) to advocate powerfully for monotheism. Yet the narrative itself clearly outlines constitutive aspects of a different (animistic) mentality. Animals are talking just like any other character. In the narrative this is treated as absolutely natural. Only the book of Numbers hints at some explanation in the divine command to donkey to speak. In both cases animals are the source of special knowledge (alternative mode of understanding the divine plan) which they communicate to humans. Even if we interpret these talking animals as a rhetorical and dramatic tools, or as a projections of a person’s own thoughts into any given animal (in fact, a kind of hallucinations) the fact that this is accepted without any substantial commentary, alarm or explanation can tell us that the narrators mind-set was different from our current most common post-enlightenment way of thinking. Many biblical animals were most likely "made silent" by dogmatic censorship of a lengthy editorial process, as I have mentioned earlier. But old underlying modes of perception and reflection of the world could not be completely eliminated. 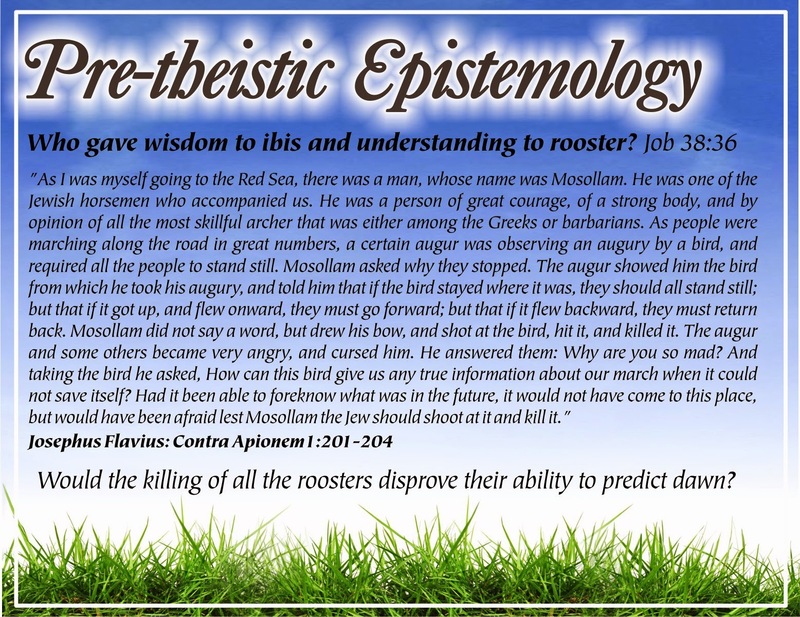 They are scattered throughout the biblical text very often unnoticed unless we know and recognize their broader epistemological context. Clearly many realities of the world were perceived as able to communicate - share messages/information. Direct contradiction in the second half of the quotation from the Psalm (it is not word, it cannot be heard X yet their voice permeates the world and words go as far as limits of the world) outlines ancient recognition of substantially different mode of this communication. 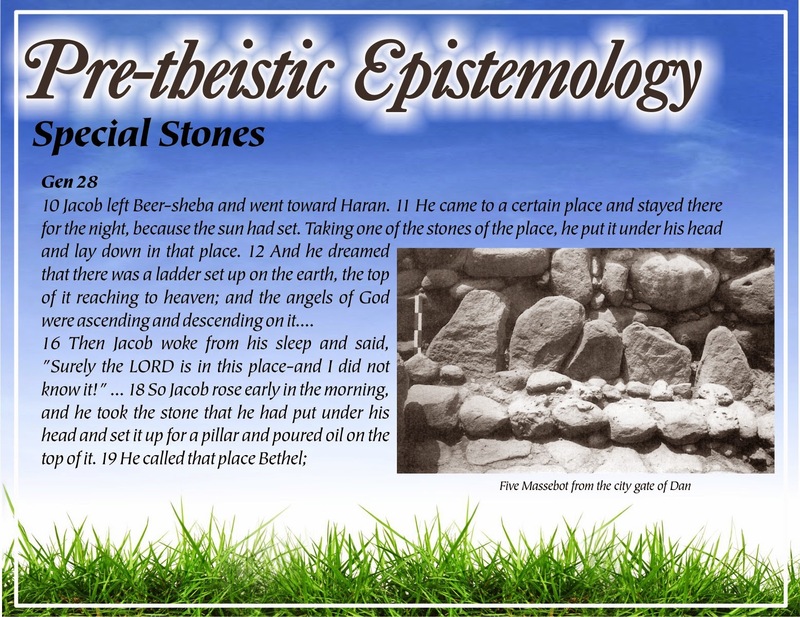 Among Old Testament scholars there has been long-standing recognition that certain stones, trees and springs in the Old Testament times enjoyed a special status. They were not only associated with mythical/legendary events and figures, but were often recognized as associated with local numina (spirits or deities). Here I am using just three examples. Each of them could easily be expanded, and a number of similar instances of special stones (or circles of stones), trees and springs can be mentioned. Archeology confirms the religious significance of stones while paleo-epigraphy and art shows stylized trees or decorated poles clearly linked with Asherah (compare this tree positioned above a lion with a goddess standing on a lion few slides earlier). Please note that in modern scholarship archeology is not used to provide support for any individual biblical text but helps with our general understanding of the religious and anthropological milieu. Here are two quotations which can help us understand the mentality of an animistic religious system and its relationship to nature. I mentioned Lynn White and his epoch-defying article at the end of our last lecture. White's article is now almost 50 years old, yet it remains relevant. It is especially relevant in the church setting because churches have never really dealt with this challenge. White nicely outlines why an animistic world-view has a higher sensitivity towards nature. We can also begin to understand why the ascent of supranatural theism of Abrahamic faiths (Judaism, Christianity and Islam) and their rampant anthropocentrism, led to the degradation of nature into an object to be exploited. All three monotheistic religions separated deity from nature and created predominantly anthropocentric religious systems (preoccupied with religious teachings, worship and human relationships). White was a medievalist, not an anthropologist-ethnologist; his definition of animism is rather schematic. 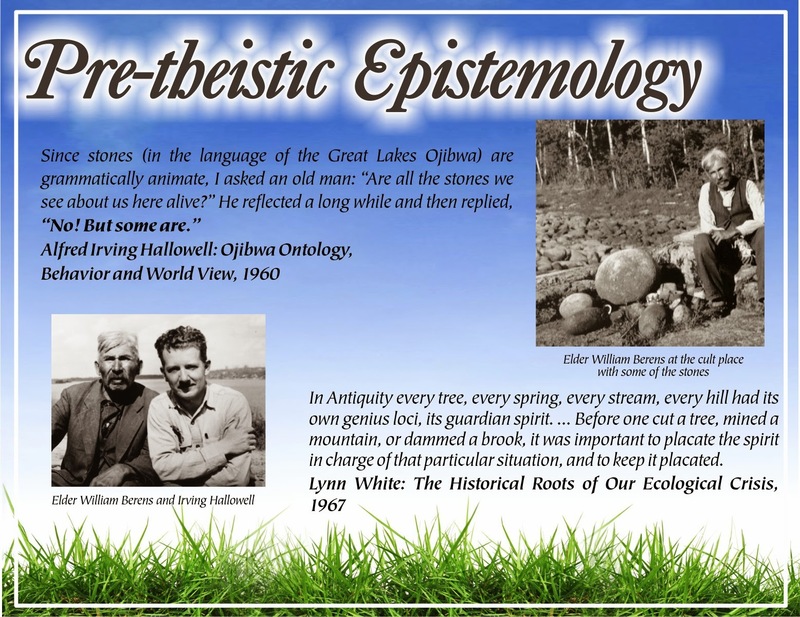 For that reason I cite the second quotation on our slide from the insightful anthropologist Irving Hallowell. It marvelously shows that our modern scientific inclination to categorize might not be an adequate method for the assessment of a different mentality. 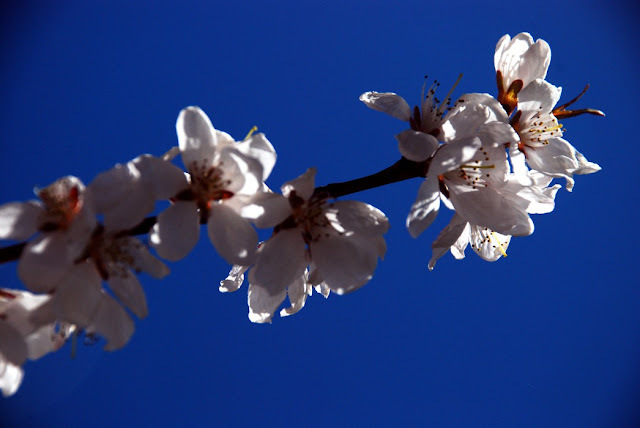 It might be true that every tree or every spring had their own numina, but they were not necessarily identical or even identically important or powerful. Lynn White in the mentioned article blamed western medieval Christianity for the objectification of nature which fostered its ruthless exploitation and eventually led us to our ecological crisis. I am convinced that this process has much deeper roots growing from anthropocentric supranatural monotheism (religious ideology which started to appear in Judaic tradition in the early Hellenistic period). This quotation from Josephus Flavius shows ruthless monotheistic propaganda on its worst. I wrote about this particular incident in an earlier blog. Augurs did not claim that a bird knew the future, but that the future could be discerned from bird’s behaviour. Josephus is recording (approvingly) anti-divination propaganda which at the end carried the day but was offensively simplistic, manipulative, and ruthless towards nature. In the end we are dependent on nature, on plants and animals to feed us. Without harmony with nature we cannot survive, we cannot separate ourselves from the rest of nature. And any religion which spreads such delusion needs to be overcome and replaced if we and the rest of the planet are to survive. As Lynn White wrote, we really need a new religion, we need a new deep mode of thinking about ourselves, nature and God. A large part of this new religion can consist in returning to a time before mechanistic and anthropocentric monotheism took over our faith. In this slide this anthopocentric monotheism is represented by Josephus, but in our faith tradition it is more fully represented by final editorial stages of the Tenach (the Old Testament). We can share many misgivings and hesitations about postmodernism, but it is having a clear impact on our thinking. It is broadening our perspective and introduces new layers of imagination, creativity and playfulness together with a greater appreciation for natural phenomena and our human responsibility for the broad environment. Here I am presenting one of my beloved artists and architects and a prophet of a postmodern way of living. 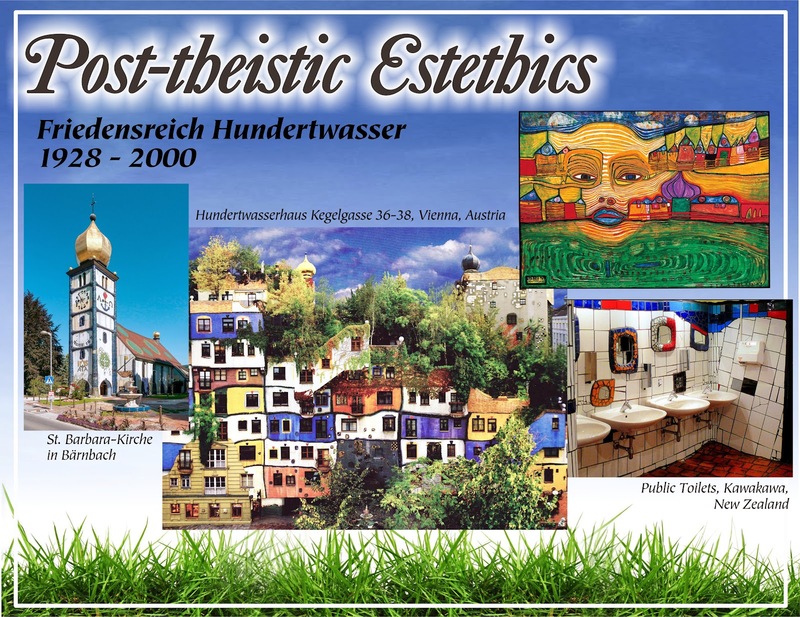 Hundertwasser was known to work with recycled and reclaimed materials. He was known for his rejection of prefabricated industrial engineering, for his respect and celebration of nature and for his love of specific decorativeness. He intentionally did not work with rulers; an uneven, naturally undulating sidewalk was to him “melody for the feet”. He marvelously demonstrates that ecology does not mean dull, grim, boring or fascist. In our world we need more Friedensreichs (Realms of freedom). P.S. 2014-06-02 - I have just discovered an interesting article by Swedish Anthropologist Alf Hornborg: Animism, fetishism, and objectivism as strategies for knowing (or not knowing) the world. Alf presents very interesting insights, I personally would trace the beginning of objectivism to the shift towards ideological monotheism. Many years ago, on one of my early birthdays, I was given a tricycle; beautiful, dark blue with a real chrome bicycle bell! I practised peddling on our driveway every weekday evening. The next weekend I was ready to take my “machine for a spin” during a family walk in a park. First I began cautiously, but soon I was riding quite fast. Probably too fast, because after a small slope I took a little too sharp a turn and rolled my tricycle. I ended up on ground crying. Dad turned back my tricycle while mom wiped my tears, cleaned few scratches on my knee with a wet corner of her handkerchief and blew pain away. Soon I cycled again and all the way home, only with newly discovered caution. Since then I have observed other moms, even the mom of my kids, using a little saliva to clean some of their babies’ scratches, if only with just a licked finger. I guess it must be some kind of a motherly instinct. This Sunday’s Gospel reading opens with something similar. Jesus is reported using his saliva to bring healing to a blind man. The early church tried to eliminate any mention of this healing practice. Most likely Jesus healing with his saliva resembled some kind of magical pagan trick. Thankfully, three stories about this kind of healing survived (Mark 7:31-37; Mark 8:22-26 and John 9 - last two passages might be reworking of the same original story). I am convinced that deeper than any danger of pagan rituals is the loving archetype of instinctive, motherly divine care. 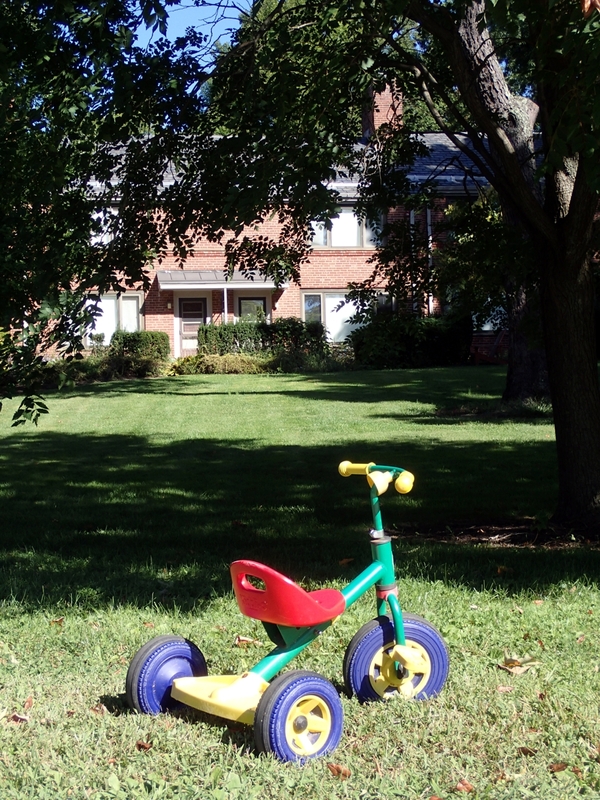 Colourful Princetonian tricycle - I took this picture early last autumn. We continue our series of Lenten Lectures dedicated to eco-theology. 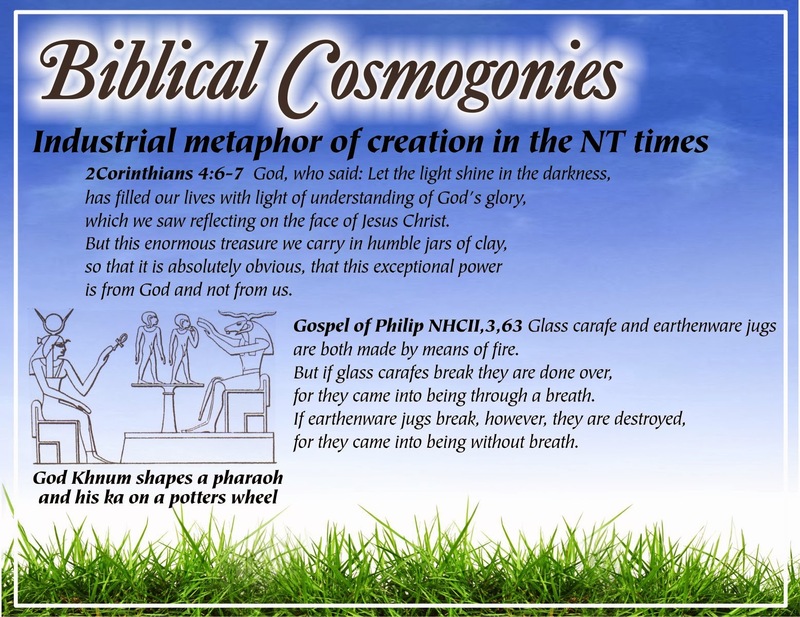 This time we will examine ancient biological metaphors of creation and how they can inform and shape our own faith, world view and our living. Many faithful Judeo-Christians would be mightily surprised by archaeological finds in Palestine (The Holy Land of our faiths). The sheer volume, and broad distribution of religious artifacts in Palestine clearly demonstrate that a strict biblical monotheism was wishful thinking and most likely a literary fiction projected back into history. Two years ago we looked into it in more detail in our Lenten Lectures on Biblical Polytheism (for instance How many Gods Made up God? or Did YHWH have a wife?). On this slide I want to highlight the use of the “Omega” symbol representing the womb as the beginning of life (with different fertility amulets). A similar omega symbol, probably representing an end-of-life womb (as a stone relief for a headrest) appears also in Jerusalem Tombs of Late Iron Age. 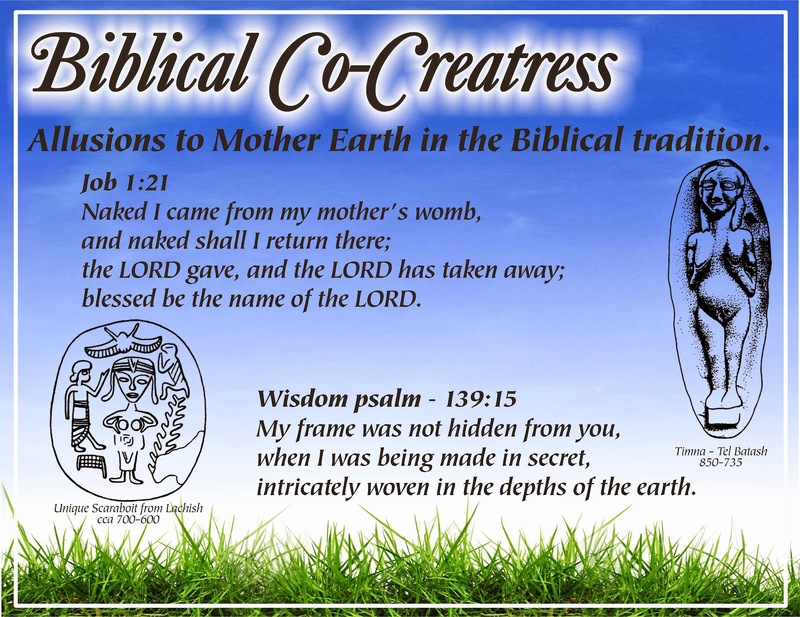 These two biblical texts, one from the book of Job and one from a Psalm (Wisdom Psalm in origin) clarify similar thinking about the mythical (symbolical) womb at both extremes of life’s journey. Two other artifacts with fertility iconography only confirm their continuous presence in Iron Age Palestine. A similar theme of the beginning and end of life appears in Genesis 3:19. One is almost tantalized to replace dust with their names (You are Adam (Earthling) and to Adamah (Earth) you will return.) This mytho-poetic statement is immediately followed with the naming of Eve - and her name is explained as “a mother of all living.” Shortly afterwards - after conceiving with Adam and giving birth to Cain (almost a homophone with “begetting” a few words later) Eve is making a very unclear statement about “begetting a man with the LORD”. This text is clearly broken and damaged (most likely on purpose). Yet, we can still suspect behind it some substantial mythical narrative. Adam is from Earth (Adamah), Eve is the Mother of all Living. She is begetting man(/kind) with YHWH (originally there even might be another deity and the name YHWH was inserted here later). Bronze age cylinder seal depicts an paradisal garden scene, a goddess in the form of a tree (of life) flanked by ibexes, a naked goddess with a worshiper, a seraph guarding the scene while buffalo, lion and a deer recline together at the bottom. Quotation from Sirach confirms that the theme of womb at the beginning and at the end persisted through the intertestamental period. In Proverbs 8 we have another powerful allusion to a female character (personification of Wisdom) present at the time of creation. Most likely her identification as “Wisdom” is only secondary - She might originally be the goddess Asherah. It is possible that this goddess was born of the god, became the god’s partner and assisted at creation (with some obstetrical allusions) , the vocabulary of the closing paragraph especially hints that she begat with the god and gave birth to mankind. 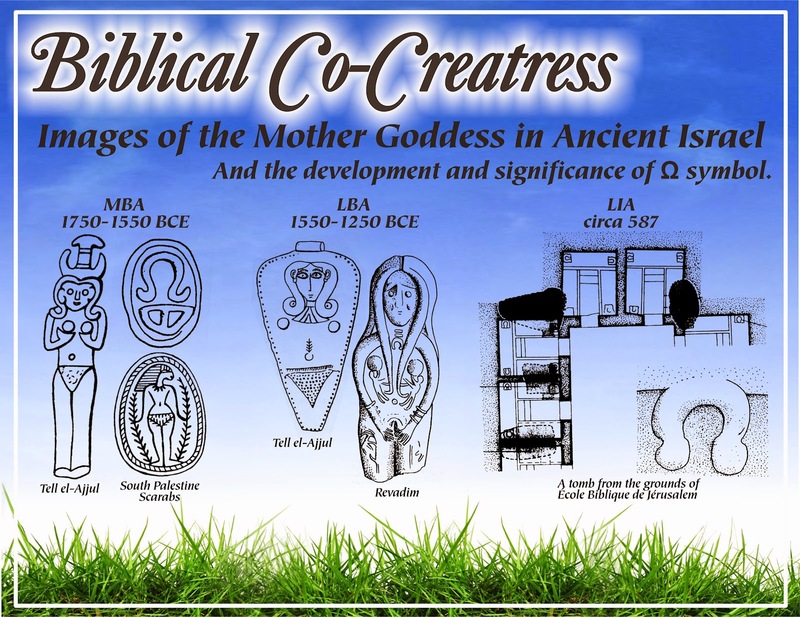 This text is probably the clearest example of the goddess co-creatress in the bible. 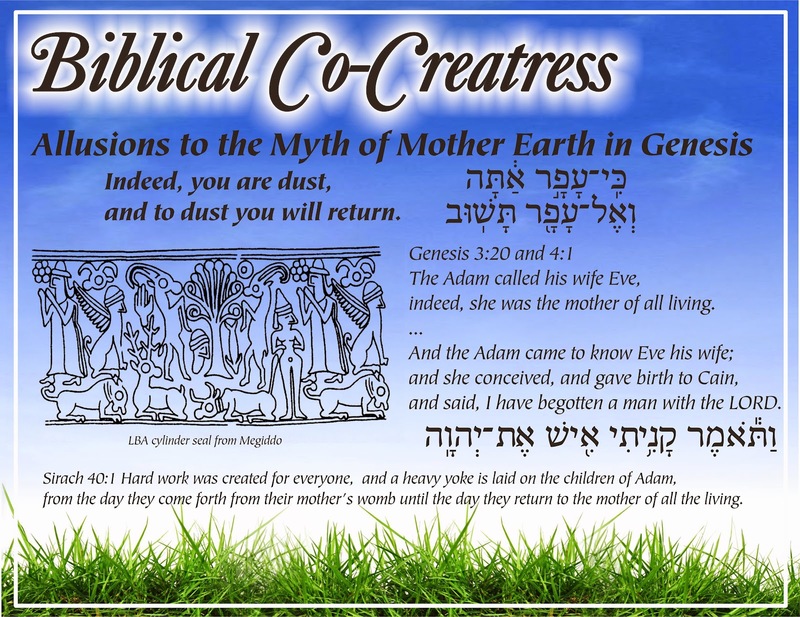 Some other aspects and possible interpretations and translations of this text are included in several older entries on this blog: Did YHWH have a wife? and Lady Wisdom. 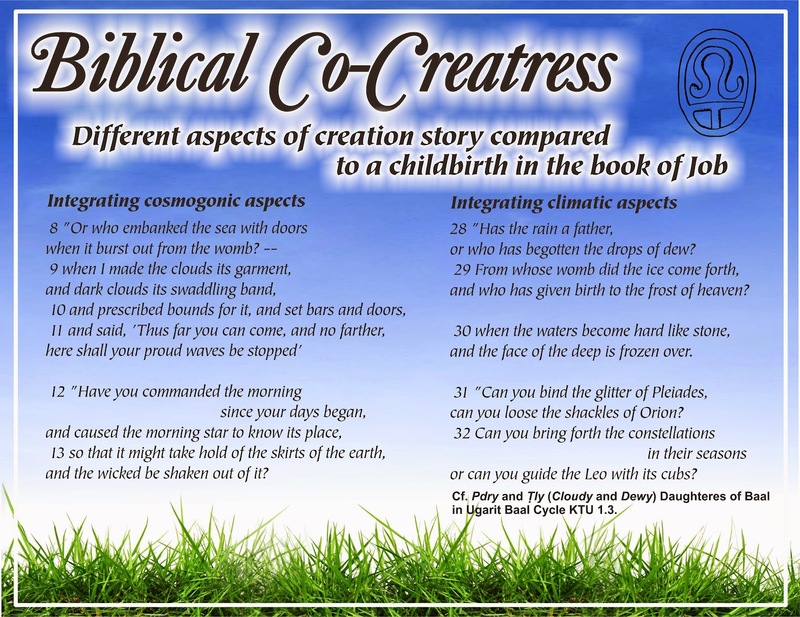 Here are two other allusions to creation in the context of the womb and the giving birth, from the book of Job. Both are followed in a similar fashion by astrological references. 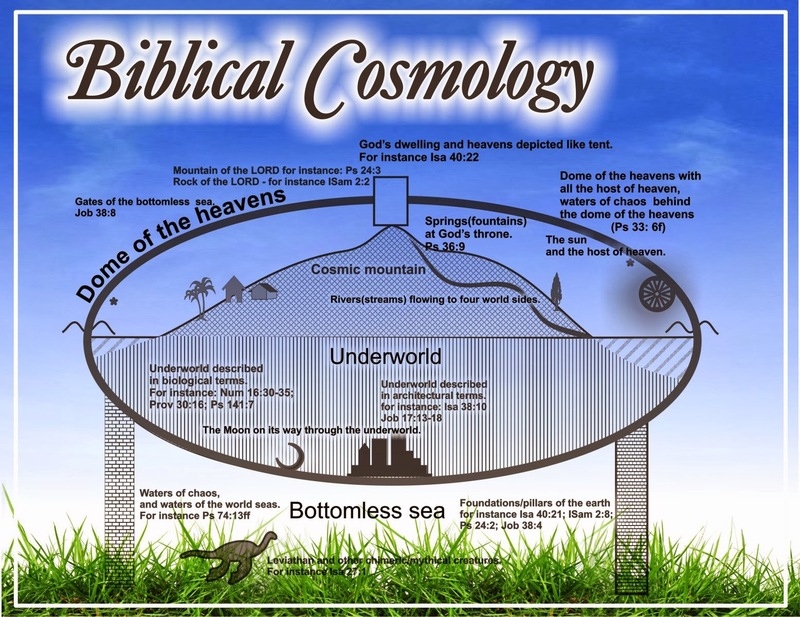 We can observe the close proximity of Cosmogony (creation of the world) and Theogony (procreation of gods). In 1966 Lynn White presented a lecture and in 1967 published in the journal Science a famous article "The Historical Roots of Our Ecological Crisis" (The article has somehow slow and dated opening paragraphs but second half is still worthy of reading even almost 50 years on!) In this article White blamed the early medieval Christian understanding of the Creation Story for fostering the mentality which eventually led to the modern ecological crisis. I believe that White is correct in his analysis that the Medieval Christian reception of the Creation Story created a mentality which led us to the current ecological trouble. White believes that a return to Franciscan piety and mentality might be our best ecological crisis strategy. I am convinced, that we need to go even further. The best strategy might be to undo the anthropocentric theistic dogmatism and re-discover and re-integrate the aspects of the original (unadulterated) creation stories in all their diversity. In our last two lectures we have been attempting to “re-think our old creation stories”, peel out the medieval and modern misconceptions of creation stories and look for inspiration at their very sources. We witnessed that the original biblical creation stories were diverse, rich and very sensitive to the outside world. 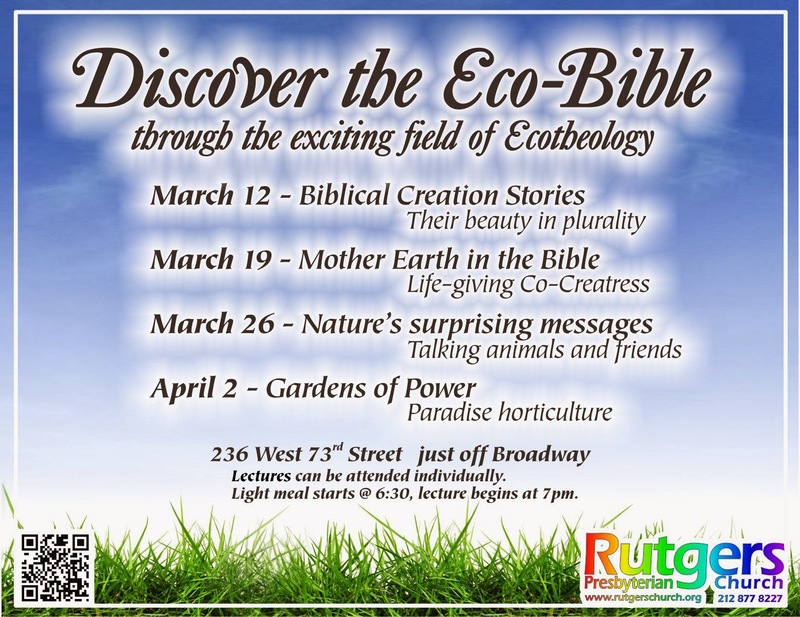 The Ancient Creation stories shared a different, gentler and more eco-sensitive world-view. Our ecological problem came with zealous monotheistic dogmatism, when God was artificially separated from nature, nature was objectified, and humans were lifted above it. I think it is time to consider undoing this religious aberration, and rediscover or at least heighten our sensitivity to a more organic religion at the source of the biblical creation stories. For centuries even millennia, western religious tradition (Judeo-Christianity) has been stricken by a particularly vicious form of anthropocentrism. Religion and theology were viewed from solely human or human-divine perspective and both human and divine were separated from the rest of environment. 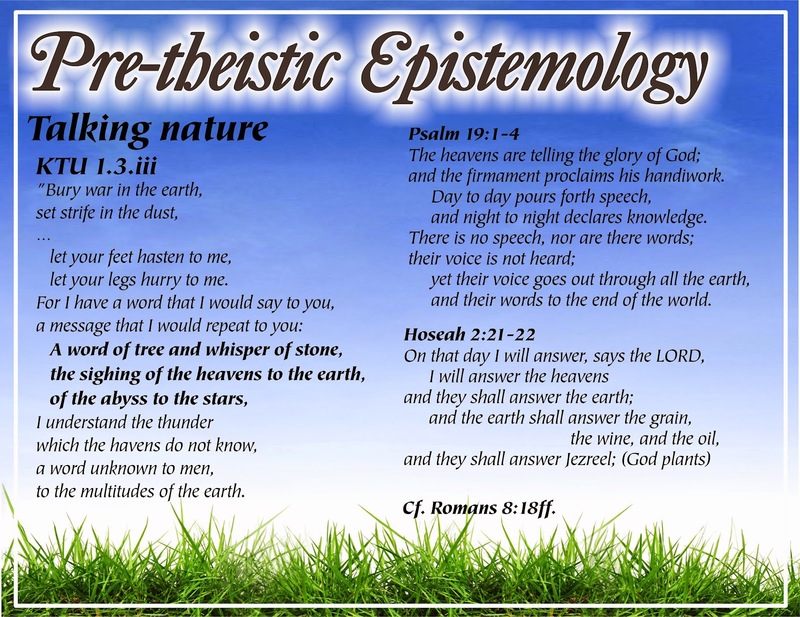 In the last decade, both in Europe as well as in North America, we have witnessed an emergence of a new theological stream called “ecological hermeneutics” and often abbreviated as “eco-hermeneutics”. It attempts to correct this egotistic anthropocentrism of western religious tradition by re-reading ancient religious texts paying special attention to ancient integration or religion and environment. This year via our Lenten Lectures we want to participate in this new theological development and discourse. 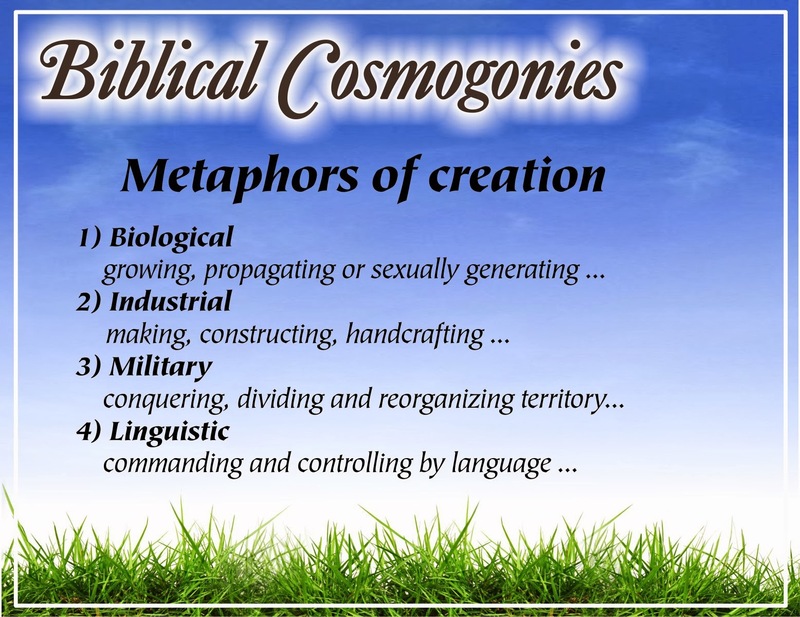 On this slide four main modes (metaphors) are used to talk about creation in the Ancient Near East. All these models (metaphors) reflect human experiences with creating, generating and organizing activities. Creation stories are modeled on the observed natural or societal processes of creation. Biological creation happens by the means of growing, germinating, hatching from an egg, or through sexual activity of different kind. The name for the Industrial category is not derived from modern industry but from the original Latin meaning “diligent effort” “skilled work”. Under this category, creation is compared to skilled work, for instance the work of an metallurgist, or a potter. Military creation is modeled on combat, the vanquishing, conquering and organizing (reorganizing) of the domain of the conquered enemy. A classical example is known among student of religion under its German name as Chaoskampf - "War (with forces) of Chaos". World of order (Cosmos) is created by conquering and reorganising disorder (Chaos). The most widely known creation story is probably the one recorded in the first chapters of Genesis right at the beginning of the Jewish and Christian Bible. 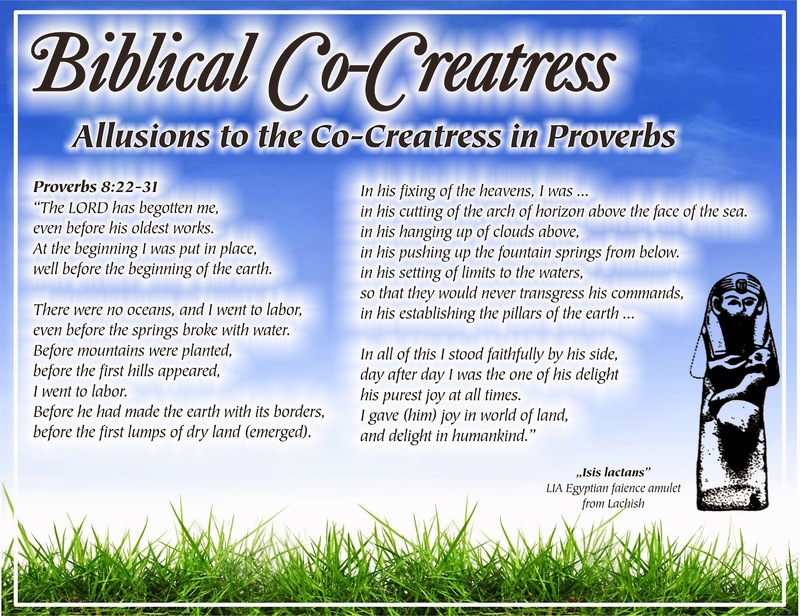 For more than a century it has been known that the creation narrative in Genesis consists of two independent creation stories (Creation in 6 days and Creation in the Garden). It is even possible that the first creation story (creation is six days) contains in its first two verses a third creation story - a classical example of Chaoskampf (overcoming the Chaos in the form of the formless void and the dark bottomless deep). The creation of the world in 7 days (six days of work and the seventh day of rest) has strong liturgical features (repetitive formulas). The creation of Adam in the Garden has strong features of industrial creation - Adam is shaped from dust and the verb used has a manufacturing, a pottery-making background. 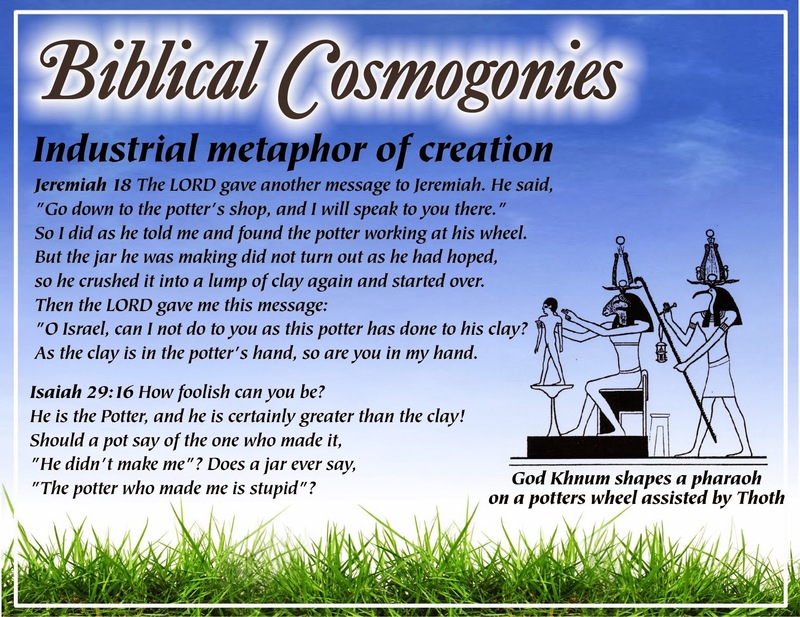 This industrial metaphor of creation is nicely and more fully expressed in several other biblical passages and has a close parallel in Egyptian iconography and mythology (Egyptian royalty was viewed as created on the potter’s wheel by the god Khmun). Similar motif appears also in the New Testament and with the development of new technology is utilized even in post-biblical gnostic literature. 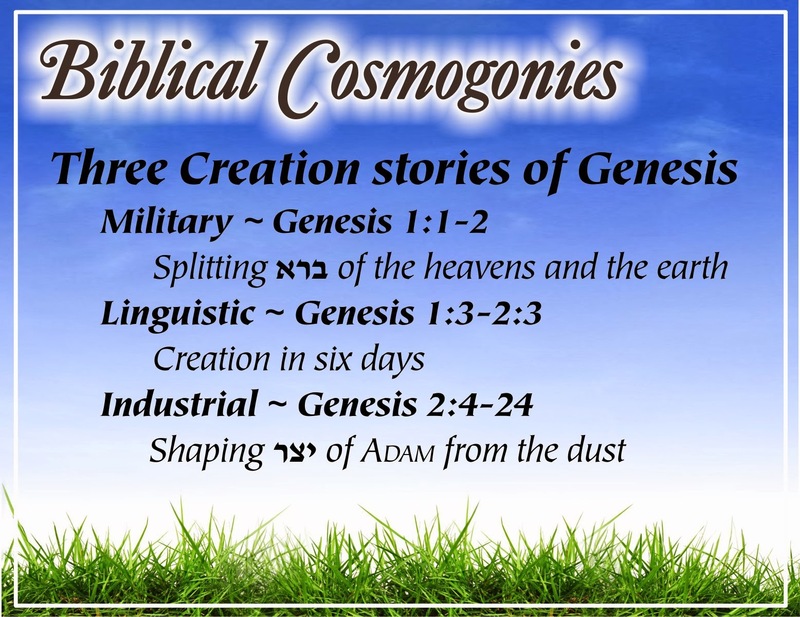 Indeed biblical creation stories are not limited to the first two chapters of Genesis, nor they are limited to the Old Testament. 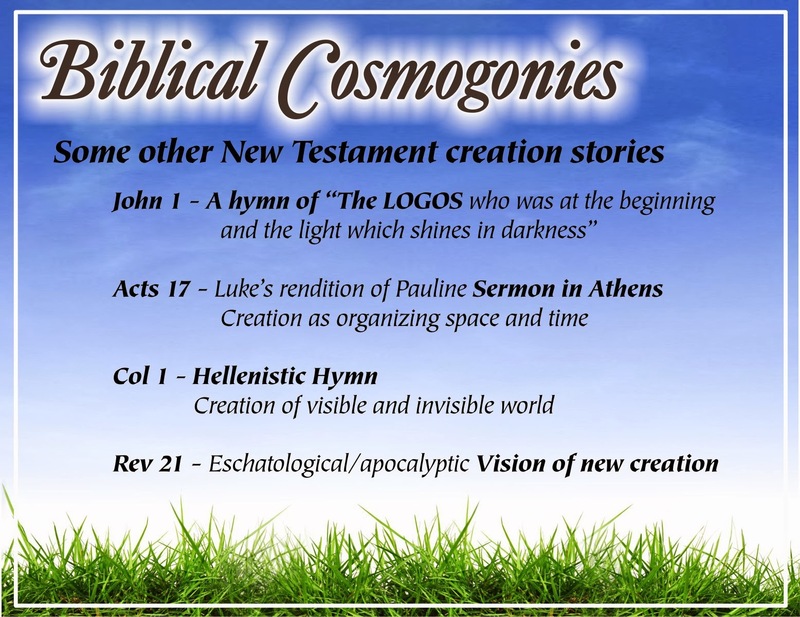 On this slide we present some well expressed examples of Creation Stories from different parts of the New Testament. This is my attempt at a graphic rendition of Ancient Near East Cosmology (world view) recreating it from different biblical fragments (quotations - many more exist, which are not included). This world view was fluent, contained substantial inconsistencies and logical contradictions yet represented a widely shared narrative. 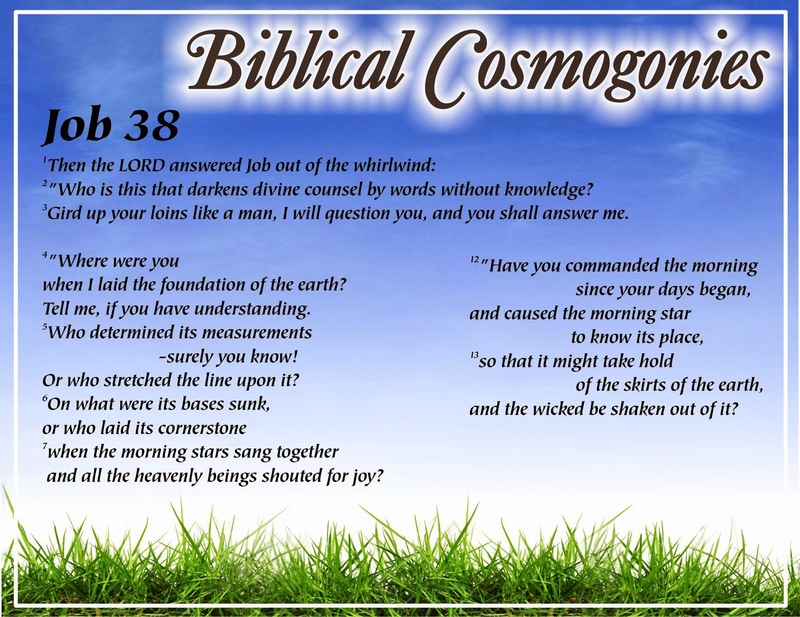 Now I would like to concentrate on two less known biblical cosmogonies (creation stories) one from Psalm 104 and one from the book of Job. 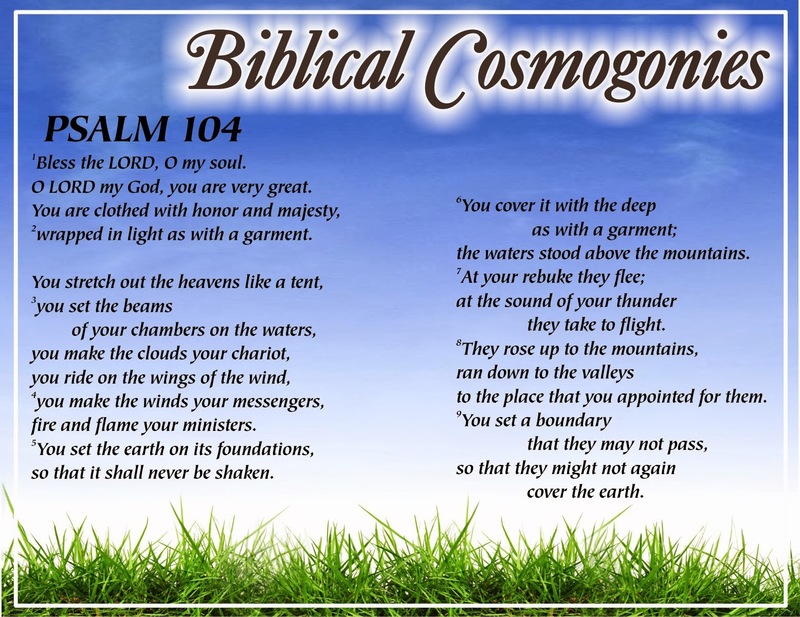 The whole of Psalm 104 is one great poetic creation story with many mythical references and a cosmology which closely corresponds to the preceding slide. 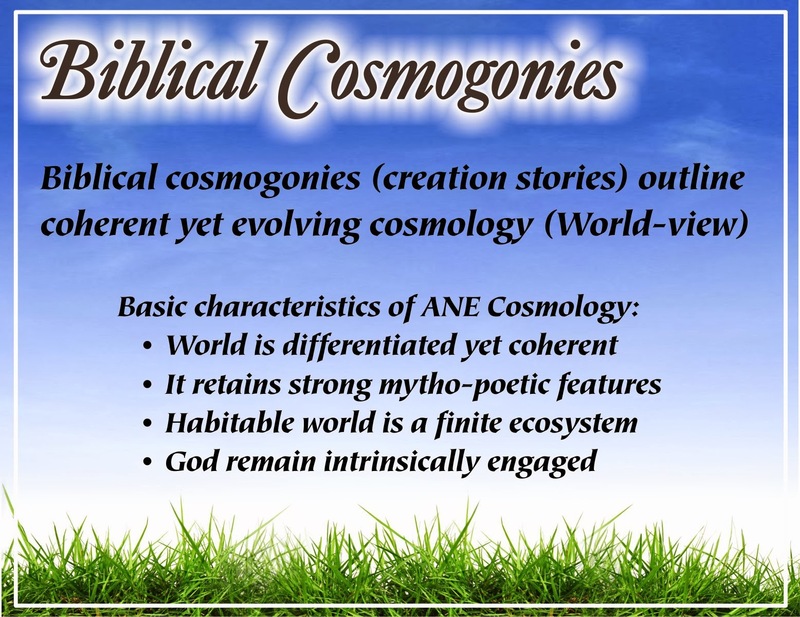 I would also like to highlight a special feature of many of these ANE creation stories which consists of a continuous divine care for creation, especially animals. The God of these creation stories is certainly not a god of deists, this god almost resembles underlying and sustaining principle of life. 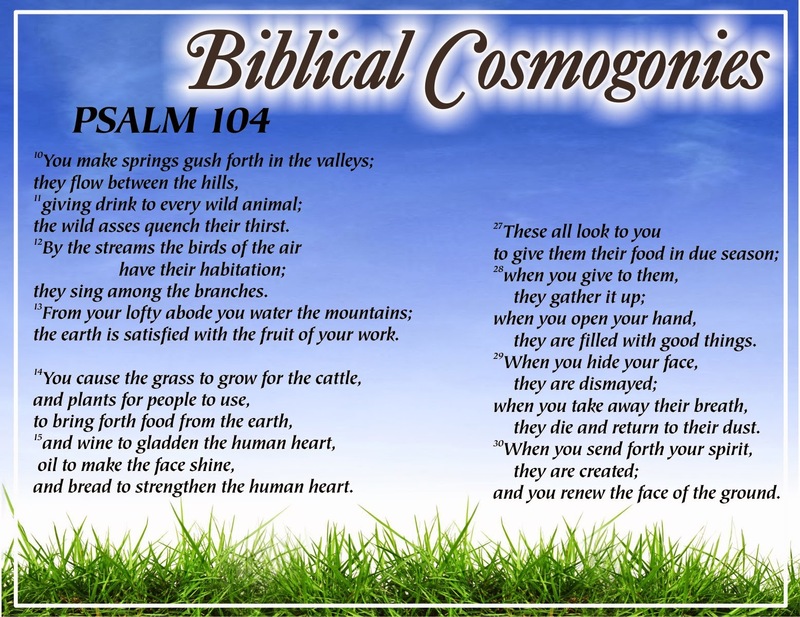 Especially in Psalm 104:27-30 God shares many characteristics which are in our modern discourse associated with the principles of biological evolution. Another extensive and exquisite creation story of the Hebrew Bible is preserved right towards the end of the book of Job (Job 38 and 39). The Omnipotence and omniscience of God is being demonstrated with the help of an extensive rendition of a creation story. 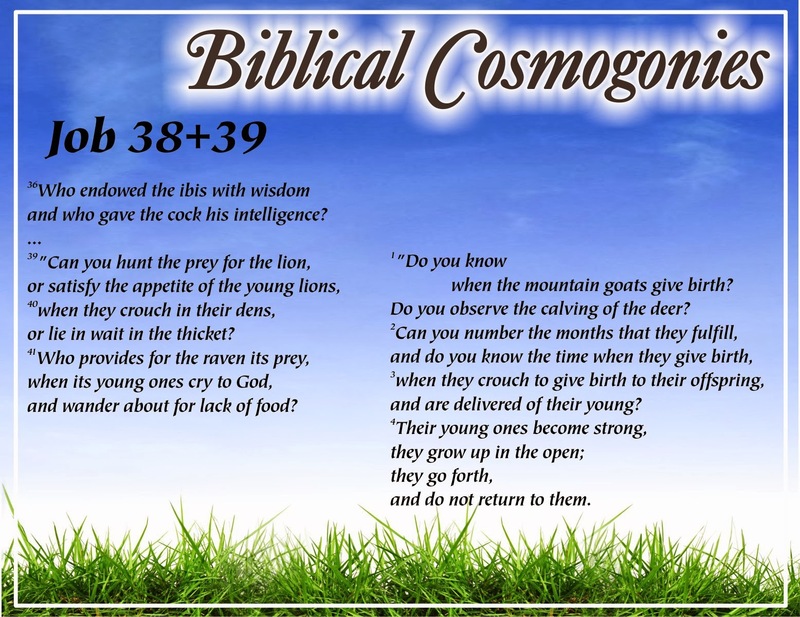 This Creation Story (just like the rest of the book of Job) is adorned with many beautiful poetic metaphors (many of them are archaic and mythical in their origins). And again in Job 38:39-39:4 we can observe the continuous gentle, even moving care of God for creation. Just as almost all ancient deities had their special sacred animals or plants, in this early monotheism (not yet alienated to nature) all creatures enjoy this special relationship - the list in Job or in Psalm 104 is almost certainly Pars Pro Toto. Here is our summary: Although Ancient Near Eastern Cosmogonies (Creation Stories) were anthropocentric in their origins, their nature and their intentions (composed by humans, using human experience as a source for metaphors, and composed to inform human religion and worldview) they preserved some deep and important insights. Ancient cosmology clearly expressed a notion that the habitable world (in its form of a bubble positioned in between the split primordial waters) was a limited, closed environment. The Cosmos (realm of order) was just a small space surrounded on all sides with threatening waters of Chaos. It was clear that human action should promote order and avoid introducing elements of chaos. God (or the heads of the pantheons) was/were the ultimate protector/s against the flood and the keeper of the floodgates of Chaos. Existential recognition and general awareness of the fact that the world ecosystem is not limitless is only slowly reaching the minds of modern people. Further, from the theological point of view - creation stories even in their monotheistic biblical reworking make it clear that God is not separated from the universe; to the contrary, God remains intrinsically engaged in this world. Again, theology is only slowly recognizing the wisdom of these ancient texts, that our relatively recent philosophical separation of God from nature is artificial, idolatrous and harmful for our faith and our environment. All of nature is the collection of God’s sacred animals and plants. Thoughtless harming of any of creatures is like shooting Artemis’ deer in her sacred forest. When we moved to America from Europe, the first thing which we did was to buy a garden windmill. After nine years spent in Prague in an urban metropolitan environment without our own garden, we were thrilled to have a garden, and we wanted to decorate and celebrate our front yard. We bought the brightest and most colourful windmill we could find. But as soon as we stuck it in the grass in front of our porch, we realized that something was not right. From our otherwise nice and friendly neighbours we started to receive surprisingly strange, and even hostile looks. Being fresh transcontinental transplants, we did not get it, but thankfully some members from our congregation helped us to understand. It all took place against the backdrop of that dark period just before President Bush dragged America to the war in Iraq and so our arch-conservative neighbourhood bristled with patriotic flags. We were probably the only ones without an American flag and certainly the only ones with rainbow colours. Our European upbringing did not prepare us for this degree of ideological flag-waiving. But from that moment on, we did it on purpose, we kept at least one rainbow windmill in front of our house. With every movement of wind the splash of colours brightened our days, stood guard against narrowminded imperial chauvinism, and expressed hope in a more peaceful future. This Sunday we will try to perform a similar windmill charm on some of the most famous ultraconservative biblical verses and concepts from the Gospel of John (“being born-again” or “God giving up His Son for the eternal egotism of some evangelicals”). Come to be surprised at how true theology, just like a splash of hopeful colours, can transform these gravely misunderstood verses like a charm. And by the way, our neighbours got used to us, especially after I visited them in the hospital (although they were from Assemblies of God), brought them their cat from our tree, occasionally helped with snow and around their yard, and played with their grandchildren. This year during Lent and Easter I want to invite you to search for Paradise. But first we need to know what we are looking for, and we need to get some basic directions. We can start with the Bible. In the New Testament Greek, Paradise is called παράδεισος “Paradeisos.” This word also appears in the Hebrew Bible, there it is rendered as פַּרְדֵּס “pardēs”. All these words: Paradise, Paradeisos, Pardes, are clearly related. They sound similar, they contain the same consonants, they are coming from the same verbal root, but they are not native to any of these languages. All these words are loan words from yet another language. Paradise, Paradeisos, Pardes are all borrowed from an old Avestan expression “pairi-daēza”. In this ancient Iranian language Paradise actually has a meaning; it can be translated as “encircled with a wall.” And it was not just any place behind the wall; it was more specifically a park or a garden. These Iranian and horticultural origins of Paradise make very good sense. Apples, Apricots, Peaches, all originated in different parts of Asia. Alexander the Great is often credited for bringing them to Europe. But he did not cultivate them, he did not even collect them from their original homelands, he just took them from Persian gardens where they had been cultivated for centuries. Persian gardens were large, important and famous. Gardens were integral parts of all Persian royal palaces, and royal princes were educated in many different disciplines and skills, but also in gardening. Gardening provided the future rulers with an excellent training in patience and self discipline. Thus when we are looking for Paradise, when we are looking for this archetypal place of heavenly harmony and bliss, we need to look to Persia (today’s Iran) and its gardens. Can you imagine, paradise originating in Iran? But even further, can you imagine, paradise not as an outward reward, but a spiritual challenge and discipline and daily work? Gardens are here only an image and training ground. The whole world is meant to be the paradise! If only we started to care for one another as well as we care for beautiful flowers and care for worldwide nature as we are able to care for orchards. Ancient Persians were instrumental for cultivation and spread of peaches - here a peach tree blooms in Brooklyn Botanical Garden. I took this picture on the 28th of May 2012 in the Brooklyn Botanical Garden. I was so intrigued by this flower that I wanted to learn more about it. Little did I know how interesting its story is! This climbing vine, native to South America, is called Passion flower. And its story is truly striking. 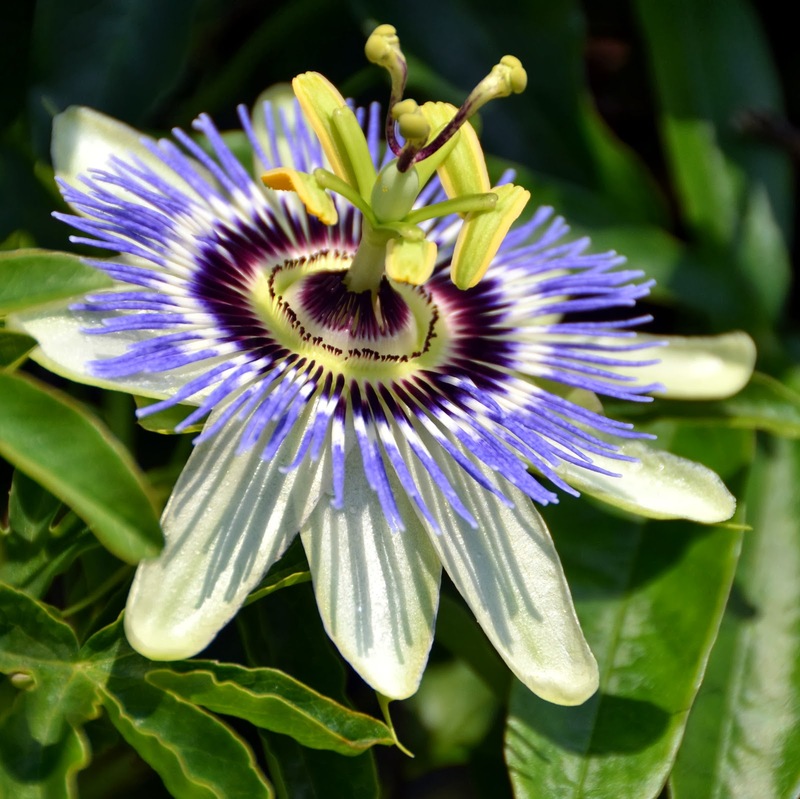 When it was discovered by the first European missionaries in the early 16th century they called it Passion flower, because they saw in this flamboyant flower the Passion of Christ: The pointed tips of the leaves were taken to represent the lances of the Roman Soldiers. Tendrils represented the whips of flagellation. Ten petals stood for the ten faithful apostles. Radial filaments resembled the crown of thorns. The mallet-shaped ovary with its receptacle was seen as the hammer. Three stigmas were the three nails and the five anthers below them symbolised five wounds. Finally blue(purple) and white were colors of heaven and purity. When, still full of astonishment, I shared this story with my friends and colleagues they gave me strange looks; for them all of this was a perfect example of superstitious medieval faith (tainted with the outrage of substitutionary atonement, they claimed). Perhaps it was so. But I remain enchanted by this story and especially its origins. What kind of a mind, in what kind of mental state, can look at such a flower, any flower(! ), and see a divine story? It had to be a pre-modern, pre-scientific mind, but at the same time a intriguingly, even luringly, creative and playful mind! Was it a poet, a child-like soul of the Little Prince, a prophet, a shaman-like psychic, a person deep in love, a visionary, or an environmentalist (before environmentalism)? One thing I know by my own, direct, first-hand experience: This story of the Passion flower opened my eyes to different stories, and changed the way I look at other flowers, at other plants, at nature in general. And not only how I look at them, it changed the way I want to live my life, gentler towards other beings, listening to their stories.